For the ninth year in a row, Jamboree BC brought the West Coast line dance community together. This year we were joined by new and old friends from abroad: two from New Zealand, one from Australia, and two from The Netherlands. We also welcomed friends from Vancouver Island, Washington, and California. There were 30 instructors present, many from out of town. It was so nice to see so many new instructors on the scene. The hall was 90% sold out, with 196 dancers, so it was nice to have that many but not have to turn anyone away. Jamboree BC continues to be the largest linedance-only event in the Northwest. (British Columbia), a suburb of Vancouver, Canada. The K.R.C. has been our home for this event since day one. Saturday morning began early with people starting to arrive at 8:00 to help decorate and set up chairs and tables. The volunteers were incredibly efficient and the hall was ready in 20 minutes. Grant and Bill had decorated the night before, so everything was all set for the doors to open at 8:30. It was a beautiful day, sunny and mild. Thanks to 90% of the dancers pre-registering, there was never a line-up at registration. Grant Gadbois, Annette Cyra, Bridget and Jennifer MacCallum, and Susan Clark kept everyone flowing in nicely. I hosted the first part of the day, and introduced our opening instructor Jo Miller who drove all the way from Richland, Washington to teach us her really fun dance "Cartoons" to the song "Witch Doctor". Jo did a great job of patterning her dance to the sections of the song which many people remembered from their youth. We also squeezed in a lesson from Carmel ("@ The Hop") Hutchinson who taught her dance "This Way". Then it was time to start the choreography competition. In our unique competition, new dances are taught and then judged by any of the dancers who wish to participate (this year well over 90% contributed their votes). Afterward the scores were tallied and an average score determined. Averaging the scores makes it unnecessary for everyone to take every single workshop. Three choreography competition workshops took place in the morning and four in the afternoon, leaving the evening for general dancing, performances, and awards. Of course there were lots of dance breaks and entertainment which broke up the day. Lunch was "in", catered by the centres staff. Due to popular demand in previous years, our deejay, Ember Schira provided dance music even during the lunch hour. Some people just won't sit down! The choreography competition continued until 3:45, after which there was entertainment and one more dance workshop. 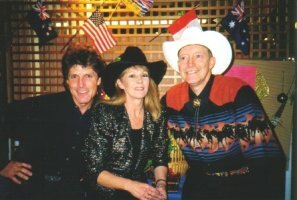 Lyndsay Ryan (from the northern beaches of Sydney, Australia) taught us an Aussie dance, Terry Hogan's "West Texas Waltz". By late afternoon everyone was ready for something relaxing but fun, so that's when we had our annual "Crazy Time". This portion of the event has developed out of such craziness as last year's Bag Dancing, which was a little hard to top. But this year I think we got even more laughs with the contest I called "The Produce Pass". You had to be there, but it involved passing items of produce up one leg, across the front, and down the other leg. Jeans were required apparel for the men as this presented a little bit of a challenge for the women doing the passing of the produce: a lemon, a banana (some with big honkin' knobs on them too), and a hard-boiled egg except for one we were not sure about. (At least that was the story.) We had 5 couples, 2 representing the US, 2 representing Canada, and one couple of Kiwis from New Zealand. And wouldn't you know it would be Graham Harris of Auckland to have the most fun with his banana. During the dinner break, dancers had two options: 1) take a two-hour dinner break for a nice leisurely dinner at the myriad of restaurants within walking distance, or 2) they could order in food (or they could have brought it) for dinner and then be treated to some quick line dance lessons by Ember Schira who breezed everybody through some of our favorite recent line dances. Hours of dancing followed featuring many of the most popular recent dances. A break was offered by Western Spirit dressed as the California Raisins. Many thanks to Western Spirit for all the hard work they put into this routine. General dancing went on until 11pm at which time only a few hearty souls were left standing. Mini Teams winners were Kirsten and Len Person, the "Bavarian Buckaroos". 1st place certificate and $100 cash award: Chirsty Fox for "Hip To Your Jive"
2nd place certificate and $50 cash award: Bev Sutherland for"G.I. Rhythm & Blues"
3rd place certificate and $30 cash award: Betty Clarke for "High & Low"
Congratulations and thanks to ALL our choreographers. The general feedback was that this was one of the strongest years for new dances and many instructors were interested in more than the top 3 dances! That's terrific! with the emcee duties. Thanks to Joe Archer for being available. And most special thanks to the special assistant without whom this event could not happen, Grant Gadbois. Jamboree BC 2002 was the last of 8 successful annual events. to anyone who contributed and everyone who attended these events!!! The photo pages will, hopefully, be a reminder of those good times. are linked in the table below. shows Michael Barr, Julie Molkner, and Bill Bader. This page was updated October, 2005. Webpage designed by Bill Bader. Special thanks to Lisa Strong for her help. © Bill Bader 2002 - 2005. Photos are not public domain.